I’m thrilled to have the opportunity to help organize – alongside Dene Grigar and Kathi Inman Berens – the first ever electronic literature exhibit and reading at the MLA Annual Convention in Seattle, WA January 5th through the 7th. The exhibit in particular, which is formally supported by the MLA, marks an important moment in the establishment of electronic literature – another pivotal point at which the field moves further into the center and away from the margins. I’m hoping it’s a moment marking the subtle shift from “electronic” or “digital” literature to just, well, literature. From January 5th through the 7th at the Washington State Convention Center in Room 609, visitors will have the opportunity to view/read/interact with: e-literature from the Electronic Literature Collection Volumes One and Two; historically significant works such as those by bpNichol and those published by Eastgate; locative works such as Kate Armstrong’s “Ping;” formally experimental works such as David Jhave Johnson’s “softies;” multimodal narratives such as Christine Wilks’ “Underbelly;” literary games such as Ian Bogost’s “A Slow Year“; and mobile works such as Mark Amerika’s “Immobilité.” These are just some of many different modes of e-literature that will be on display. The complete list of works is available on the exhibit website. 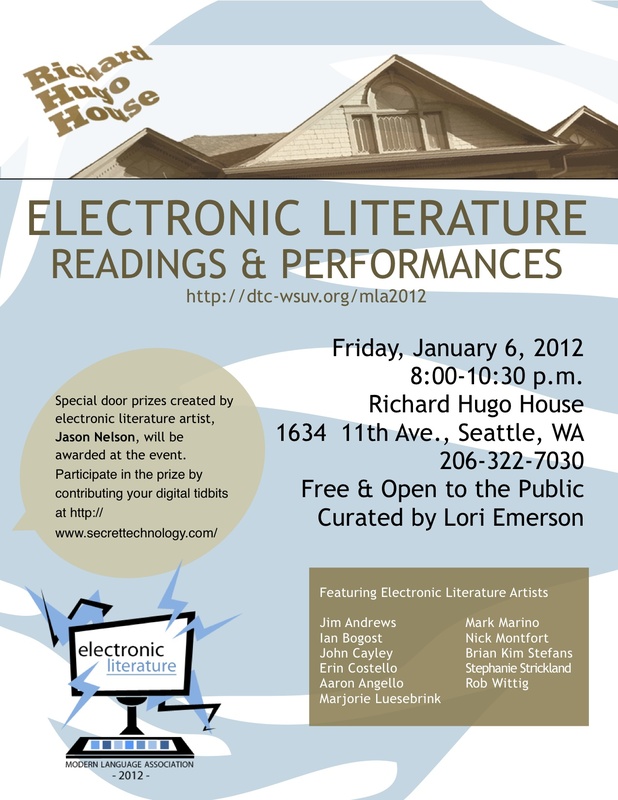 Also, on Friday January 6th from 8pm to 10.30pm, there will be an MLA off-site reading of electronic literature at Richard Hugo House (1634 11th Ave Seattle, WA 98122-2419). If you are in Seattle in early January, please make sure you stop by as it’s a rare treat indeed to have the opportunity to hear these extraordinarily innovative writers read together: Nick Montfort, Stephanie Strickland, Marjorie Luesebrink, Jim Andrews, Erin Costello and Aaron Angello, Mark Marino, Talan Memmott, John Cayley, Ian Bogost, Brian Kim Stefans, and Rob Wittig.